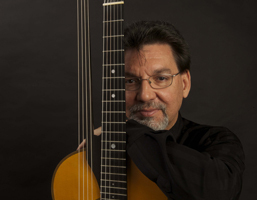 Robert Trent has performed on the continents of North and South America and in Europe on modern guitar, Renaissance lute, and historic instruments of the nineteenth-century in particular the 10-string Scherzer and authentic 19thc. guitar. A first prize winner in numerous National and International competitions including; the Webb National Guitar Competition, the Masterworks Young Artist Competition (all instruments) and the chamber music prize at the International Competition “Arturo Toscanini” in Italy in Period Instrumental performance. A recording artist for Dorian Records© (with Duo Firenze) in “Italian Nocturnes: Music for Fortepiano and Early 19thc. Guitar” he is also featured on the new CD “Traveler’s Tales” TownHall Records (CPS-8776) in works by American Composer Byron Petty and on third CD with flutist Leslie Marrs on the Oasis label, entitled, “Robert Fruehwald: Flute and Guitar Music”. “A SEASONED ARTIST STRUMS THE DEPTHS (headline) “…. he seemed most intent on using his sweet, crystalline sound to plumb the emotional depths of each work.” PHILADELPHIA INQUIRER. In addition to his in solo recitals he performs regularly with fortepianist Pamela Swenson Trent (as Duo Firenze). In past summers they have been in residence as performers and teachers in period instrument performance at the “Accademia L’Ottocento” in Rome and Verbania in Italy. Duo Firenze is the recent recipient of numerous awards including: unprecedented two Career grants from The Johns Hopkins University – Peabody Conservatory, two Faculty Development Grant from Radford University, twice from the Virginia Commission for the Arts. Dr. Trent is currently chairing the national standards committee for the guitar division of the American String Teachers of America (ASTA) and served as editor of “Soundboard-Scholar,” journal of the Guitar Foundation of America (GFA). He was the conductor for the inaugural concert of the All-Virginia Guitar Ensemble, which is composed of guitar students selected by audition from across the Commonwealth of Virginia. He is the first recipient of the degree Doctor of Musical Arts in guitar performance from the Peabody Institute of The Johns Hopkins University where he studied with Julian Gray, Manuel Barrueco and lutenist Ronn McFarlane. He also holds a Master of Arts of degree from Trenton State College (now The College of New Jersey), where, as a graduate student he served as graduate assistant and later serving as adjunct instructor of guitar and a Bachelor of Music degree from the Philadelphia College of Performing Arts.